As a group of young scientists and engineers at early stage of our careers we share knowledge, enthusiasm and collaboration readiness around the globe. Multidisciplinarity and diversity in perspectives are our tools for pushing new technologies. We are Young Professionals and we will see you there at MED 2018. 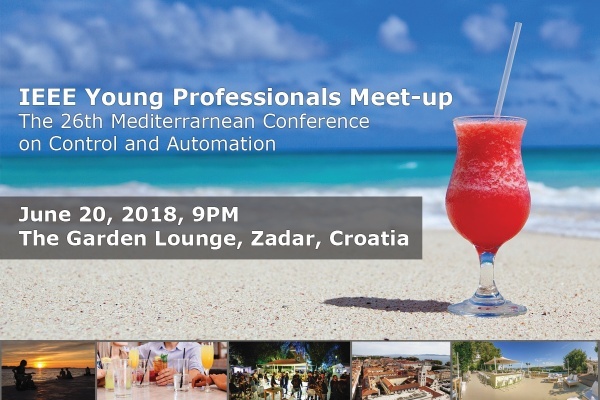 On the evening of Wednesday, June 20, at 9 p.m., you will have a chance to meet us at our networking event, called “IEEE Young Professionals Meet Up”, in casual atmosphere of a nearby bar. The MED’18 IEEE “Meet Up” is a social networking event, a place to form new contacts and explore collaboration opportunities among Young Professionals, suited to a casual bar ambience and open to all interested visitors: conference participants, local IEEE members or any other passing individual. The meeting point is the bar “The Garden Lounge“ located in the center of the old town, within walking distance from the conference venue. This reception is organized by IEEE Young Professionals Croatia. Entrance is free.